We are currently offering FREE enrollment in our on-line course “Professional Ethics and Issues for the Addictions Professional”. 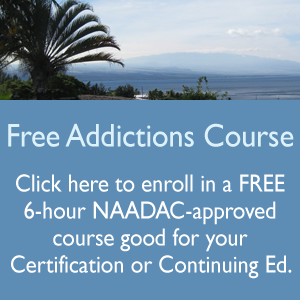 All of our courses are approved by NAADAC as well as the Hawaii Dept. of Health’s Alcohol and Drug Abuse Division. This could be a great introduction to a new career as a certified substance abuse counselor, or a nice addiction to your continuing education requirements as an addictions professional. The value for this course is $75. You may complete the course at any time in the coming year, but must enroll by November 15th. We hope that you will take advantage of this opportunity to get to know our courses and our academy a little better. Following successful completion of the exam, you will be awarded a certificate for 6-hours of “Verified Home Study” which you can immediately download from our site. Go to http://substanceabusecounselortraining.com and click on the link for this course, it will take you through the process of registering on our site and enrolling you in the course.